Playing music together in a group is what really brings music alive for a lot of budding young musicians. For many that valuable experience takes place on a Saturday morning between 9am and 12pm in one of our five vibrant Music Centres. 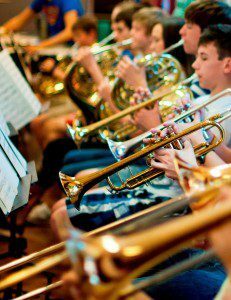 These include a range of progressive groups from beginner through to advanced and include Wind bands, Folk, Jazz in one of our six vibrant Music Centres and Rock Groups, String Ensembles and Guitar Groups. The WMS instrumental teacher is a crucial link between tuition in school and the Music Centre providing support and a friendly face! In most cases young musicians are invited to attend by their instrumental teacher when they are at an appropriate level. This usually occurs between six and twelve months after commencement of tuition. Music Centres also provide numerous performance and concert opportunities for the hundreds of young people that attend. Please click on a ‘Music Centre’ link on the main tab at the top of the page for further information of groups and times. In addition to Music Centre groups WMS also run weekly central ensembles. These include groups such as Wakefield Youth Orchestra and Wakefield Youth Choir that are generally for young musicians who have reached a higher level of musicianship. Please click on a ‘Central Ensemble’ link on the main tab at the top of the page for further information about these group. If you would like to speak to somebody or find out how to join then please contact the music office.